The i20 will launch in India by December and in two years the i30 and i40 will be available. MUMBAI – Hyundai Motor India Ltd. is bringing its entire i-series range of compact cars to India in a well-orchestrated plan. Despite a gloomy market, Hyundai is riding high on the i10, launched last year. 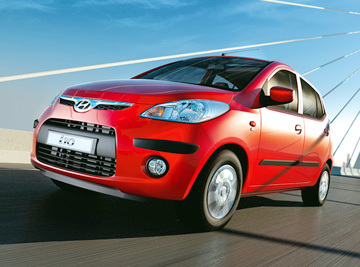 The new model in its first seven months sold more than 65,000 units in India. The subcompact now offers a choice of a 1.1L Epsilon or 1.2L new Kappa engine. The newer mill has more power, improved fuel economy and meets Euro-5 emissions standards with 119 g/km of carbon dioxide. “With continuous innovation in technology and design, the engine is the best in its class,” says Hyundai India Managing Director and CEO H.S. Lheem. The Hyundai i20 Getz replacement, which makes its debut at the Paris auto show in October, will be available here by December, and in two years time the i30 and i40 will arrive. Additionally, the auto maker in the next three to four years will offer an 0.8L small car now under development that will launch globally from India. The i20 will be built alongside the i10 at Hyundai’s recently opened, second Indian facility in Sriperumbudur. Parent Hyundai Motor Co. Ltd. insists it is not looking to compete with the super low-priced Tata Nano, which will sell for $2,500. “(The) Nano is not our focus segment. We do not have the capability or expertise to match Tata (Motors Ltd.),” Lheem says. Hyundai India’s combined domestic sales and exports jumped 33.9% in August, to 44,710 units. That compares with declines at Maruti Suzuki Ltd., down 9.2%, and Tata, off 6.2%. To meet the industry slowdown, Hyundai India has changed its production plans. In the year’s first-half, the auto maker built 58% of its cars for local consumption and 42% for exports. Second-half builds will see 45% earmarked for the domestic market and 55% for export. Hyundai is India’s largest exporter of cars, shipping 23,100 units in August. Hyundai also has deferred its decision to introduce a third shift at its new plant with a 300,000-unit annual capacity in the wake of the slowing market here. The plant produces about 830 vehicles per day with two day shifts. The nightshift, if introduced, would have added 1,200 workers and taken output to 1,190 vehicles per day. Hyundai’s first plant, which also has an annual capacity of 300,000 units, employs three shifts and rolls out 1,080 vehicles per day. Hyundai India sells 10 models, with 30 variants across all the segments. The new Kappa mill is manufactured at Hyundai’s newly opened $250 million engine and transmission plant in Chennai that has annual capacity for 250,000 units. Developed over a period of 48 months, the Kappa is being produced in three variations for India, Europe and other world markets. The India version has a displacement of 1.2L and generates 80 hp. For Europe and other markets, the engine has a 2.5L displacement. The Kappa-equipped i10 here will be available with a 4-speed automatic transmission.